This is this year’s Man. We’d show you more, but then we’d have to kill you. We wandered out to the Man Base for the first time on Wednesday, and there were lots of new faces and lots of building going on. We were on the cautious side, though, because word has come down from on high that there are to be no spoilers about what the Man and the Man Base look like this year. In other words, no sharing pictures on social media. So we walked around a little sheepishly, because, you know, taking pictures is kind of what we do. Mary Poppins, who’s running the show at Man Base, couldn’t have been nicer about it, much to his credit. He had no problem with our snapping away. As long as we didn’t post them online, of course. But he wasn’t heavy-handed about it at all, and we didn’t feel like he’d hunt us down and rip the phone from our hands if he spotted a snappie on Facebook. But everyone likes to have pictures from the build, to show progress over time, so there was no general ban on cameras being enforced. And Mary Poppins isn’t the one behind the move. This is, as we say, a directive from on high. And we have no argument with the intent: There’s nothing like seeing something for the first time when you get to the playa. We remember our first year at Burning Man, when we pulled in during the early evening and then spent the next couple of hours getting our camp squared away. Everything was new and strange and maybe a little weird. And nothing prepared us for that moment when we hit the Esplanade at night for the first time. Blinkies and glowies and lasers and flames and big big sound, and it seemed like the lights of the city went on forever. The size was breathtaking (and this was in the now-quaint year of 2004, when there were only 30,000 people or so in at the height of the event). But it sure seemed huge to us. We were astonished, and just to be out in it, exploring, laughing … unforgettable. A lot is different now, of course. The real sea change took place the first year the event sold out. It was the first time that you couldn’t just decide at the last minute that … yeah, Burning Man, let’s go! And even during that first year or two of ticket demand exceeding supply, it still seemed pretty easy to score a ticket on Craigslist, or from a friend. You didn’t need a vehicle pass, either. Also in those earlier years, this was truly an off-the-grid event. Cell coverage? You might have gotten some roaming coverage in Gerlach, but you’d start paying big overage fees about the second time you checked your email. Out on the playa you could forget it entirely. And probably most significantly, in those dark ages, mobile photography was virtually non-existent. There was no Snapchat or Instagram. Facebook was around, but it wasn’t picture-centric the way it is now. It was a very different experience, and the Powers That Be would like to bring back some of that feeling. And what’s wrong with that? Larry Harvey his own self has been musing on the topic for awhile now. We remember attending a conference in 2015, where he spoke about trying to bring back the surprise of seeing something for the first time when you got to the playa. And we supported the notion, and we said that maybe we should make it an Accepted Community Value (ACV, trademark pending) to take pictures of people and not things when we’re out here getting everything ready. We’d be more likely to be present in the moment. We’d see fewer annoying people taking annoying selfies. Pictures from Burning Man would no longer dominate the social media feeds of people who are not here, thus reducing their bitterness and hostility. Fewer people whining about nonexistent wifi. We could go on, but why bother. The notion is clearly a winner. Make it the 11th Principle. #nospoilers #offthe grid. #beherenow. #putdownthatphone. Also yesterday, we made the rounds of various work sites, checking in, watching the city take shape. And then in the late afternoon, we high-tailed it off the playa as big dark clouds starting moving in. We’d heard second-hand reports from the work radio that there were storm cells to the north of us and storm cells to the west of us, and no less an authority than Bubblegique was predicting heavy rain. While most of the DPW crews have moved onto the playa, we’re still hunkered down in Gerlach, waiting for a path to clear so we can get our trailer out. So back to town we went to wait out the storm. Sure enough, by 6 or so, there was more lightning, but unlike the night before, this time there was also lots of wind and rain and thunder, too. The trailer was a-rockin’, but there was nobody to come a-knockin’. We joked that it was nice to see the women were empowered to do the heavy lifting. At the Tech site, Camera GIrl told us that the pompoms she borrowed were helpful when she had to signal the heavy equipment operators as they positioned containers. This is the container we spend way too much time in, filing dispatches. Jay said they can erect a 60-foot tower in about an hour and 20 minutes now. Meanwhile, at the Center Cafe, the center posts and outer ring have been installed. Your photos just get me more amped up to be there sooner!! Can’t wait to hit the Playa this year! Thank you, John! John – Thanks as always for your posts, which I”m following with avid interest. Somehow this 23-year-in-a row burner is not jaded….yet. Still thrills me to see the city becoming real, and I love to see all the women helping to build it. DPW rocks!! Especially the WIMMENS!!! Iḿ so excited to be part of the Center Camp Cafe build this year! I love this post! Your photographs made me cry. Home is where the heart is. And you pictured it for me. Thanks to every early builder making this home for the spirit possible! 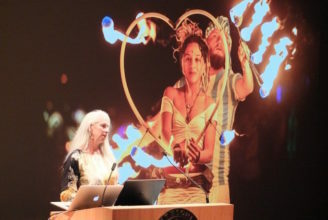 I love the photos and I love the live video feed during Burning Man since I will never be attending the event. All the pictures and the live video have spurred my interest in Burning Man. Looks like Ribby is back! YAAAAA! The 11th principle is *consent and should be adopted by the Bmorg. Thank you for taking time to write about what you are experiencing. And the photos are wonderful, too. Sorry that I won’t be able to make it this.